I’ve managed to go through all of my Red Plum coupons. I still need to go through my Smart Source and P&G coupons. With the Red Plums, I threw away any coupon flyers that didn’t have any coupons that I need. I kept the ones with coupons that I would possibly need, and I listed those coupons in my Excel coupon spreadsheet. I went through the weekly ads and made lists by store of sale items that I need. When the Sunday paper comes out tomorrow, I’ll do the same with the new pharmacy ads. I went to Costco today and stocked up on frozen chicken breasts, frozen mixed veggies, instant oatmeal, Ritz crackers, bagels (much cheaper than going to the bagel shop), Bisquick, chocolate chips, thyme, hot dogs, cheese slices, and a few other items. I like getting things in bulk, because I don’t have to worry about constantly replenishing them every week or so. The items I get from Costco are usually ones that have better deals than my local grocery stores. Food Storage Made Easy has a great post on how to set up an emergency binder. Emergency binders hold important information that you would need in a disaster (have to leave your home, fire, etc.). Basically, when you grab your 72-hour kits, you also grab your emergency binder. Food Storage Made Easy recommends using sheet protectors and filing information such as insurance policies, bank statements, immunization cards, etc. I added a section for bill statements as well. They recommend using dividers, but I just labeled each sheet protector. Are you prepared with an emergency binder? Leave a comment to share how you do your emergency binder. Click here to check out the new Fun With Food Storage Network! I’m so excited about this new blog! Three sites have teamed up to help you build, gather coupons for, and cook your home food storage. 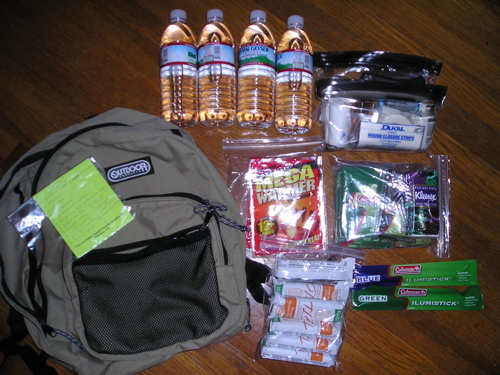 To learn more about emergency kits, I watched videos on YouTube, and did an online questionaire on www.shelfreliance.com. After making a list of what I needed (for basic kits), I went to Target, Academy, Wal-Mart, 3 Goodwill stores, and REI. A pleasant surprise at REI was that I had a dividend that I hadn’t used yet. I put the items for my car kit in a backpack that I found at Goodwill. My 72-hour kit (for 2 adults) is in a large duffel bag from my closet. I’m considering adding clothing, baby formula/bottles/pacifiers (for others, not us), and additional items to the 72-hour kit, but I’m still thinking about it. As my husband said, “We’re more prepared than we were before.” As for the shelf life of the food, we plan to make a meal of items as they get close to their expiration dates next year. Then, if they taste good, we’ll add more to the kit.